Having just purchased a Lenovo Yoga 920, I thought I would offer the following (probibly too detailed) review for any interested parties. This is now the third yoga laptop I have owned. First a yoga 2 pro in 2013, then a yoga 900 in 2015 and now the 920 here in 2017. 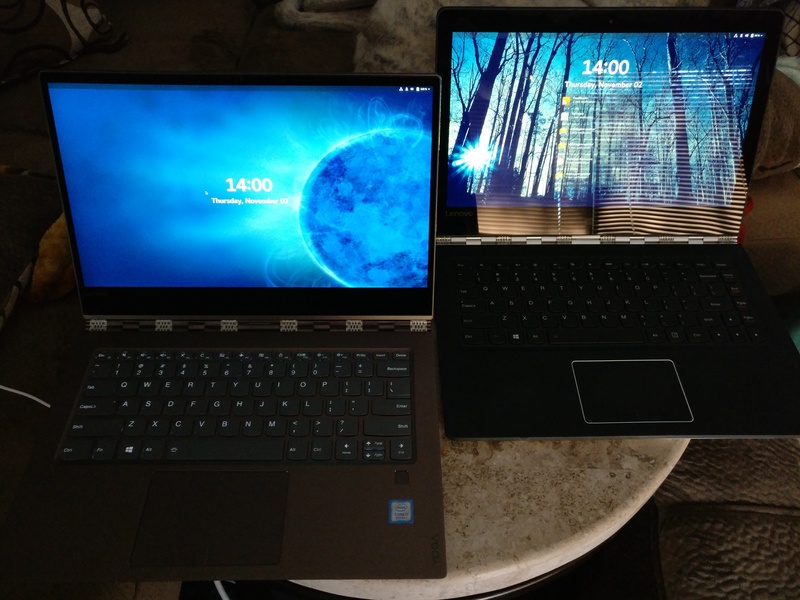 Lenovo does come out with new models every year, but for me at least they don’t become compelling to jump to until another model, so I have skipped the yoga 3 pro and the 910 models (and all the other side models they have now like the yoga 700). This cycle I seriously considered moving over to a dell xps 13 developer edition, but in the end a few things drove me to the yoga 920: 8th gen cpu (which tuns out to be a pretty big deal, see below), higher screen resolution, and no “nostil cam” (webcam at the bottom of the screen looking up). I use a laptop as my primary machine, so I am sitting at it typing away for many many hours a day, which makes it well worth it to me to get something nice. The dell xps 13 developer still definitely has some advantages, like firmware updates via fwupd seamlessly in Linux instead of needing to keep windows 10 around just to do that. As I usually do, I went for the top of the line model. The 920 is supposed to come in 3 colors and 3 ‘glass’ editions. The colors are “platinum”, “bronze” and “copper” and the glass ones have a gorilla glass overlay over the cover with a design on it: A fancy wave pattern “vibes”, a star wars rebel logo and a star wars empire logo. The copper and star wars models aren’t out yet, the vibes model didn’t seem worth an extra ~$300, and the platinum seemed kind of boring, so I went with the bronze model. It’s a pretty dark coppery bronze and it looks pretty nice. 1 headphones/headset jack. I predict I will never ever use this. 1 very very tiny “novo” button to get into the bios or recovery or the like. Keyboard with 3 levels of backlight (low, high, off). The laptop feels very solid and sturdy. It’s a slight bit lighter/thiner/smaller than the 900. The top lid has a slight overhang over the bottom, which actually makes this laptop much easier than the yoga 900 to open. The screen is very lovely… and side bezels are very very small. The top bezel is a little bit wider (to accoodate the webcam I guess) and the bezel on the botton is about an inch or more. The keyboard layout has changed a good deal: They removed the home/end/pageup/pagedown dedicated buttons on the right and lumped them into being Fn arrow keys. They also shrunk the 2 dedicated up/down arrow keys to 1/2 height. The missing pageup/pagedown and small up/down arrows has been anoying to get used to, but otherwise the keyboard actually “feels” much better. It’s just more relaxing to type on than the 900 or the yoga 2 pro. The touchpad is large and responsive. If you press it with CPU intensive tasks you can get the fans to fire up, but they are not any worse than the ones in the 900, and it fires them up seldom in day to day use. The speakers seem a bit better than the 900’s, but if you really want to listen to something, put on headphones, as all laptop speakers are likely to disappoint. With my previous yogas I had just wiped the drive entirely and installed Fedora off the bat. This time I wanted to keep a windows partition around so I could upgrade firmware and the like. This turned out to be a large time sink. 🙂 First I got sidetracked because I assumed I would have to tweak the drive settings in the firmware and change from Intel raid to AHCI. Turns out thats not possible (no options for it) or needed (linux sees the NVMe just fine). Next I ran into windows saying it would only shrink itself by about 50%. I did not want to give it 1/2 of my disk for a glorified firmware updater, so I had to mess around with disabling page files and hibernation and all sorts of things until I could get rid of the “unmoveable” files in the middle of the disk. Finally I managed to do so and shrunk windows down to about 50GiB (still too much, but better than it was). I grabbed the latest (at the time) Fedora 27 nightly Workstation iso and copied it to a usb drive, then booted from that. Things looked pretty good in some casual testing, so I went ahead and installed Fedora into the free space there and booted up the install to customize/add things and upgrade to Rawhide. On reboot it seems I had no bluetooth or wireless. 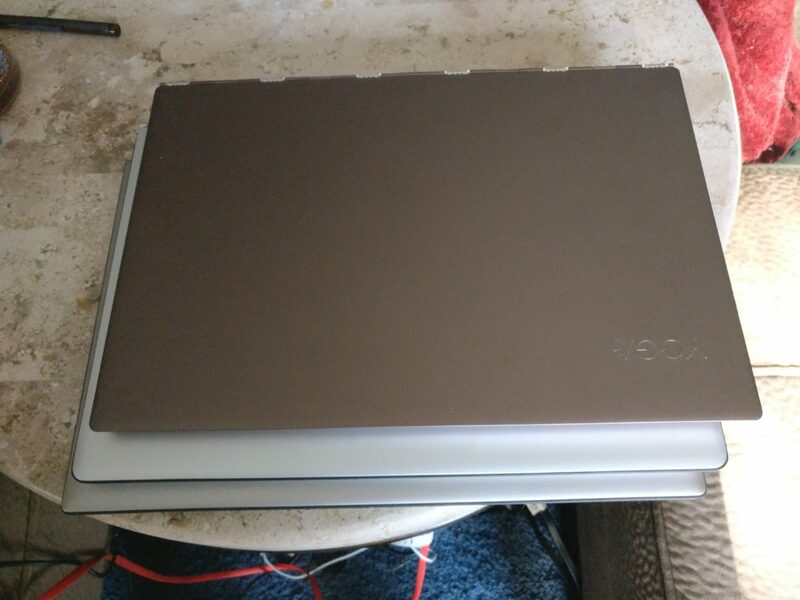 As was the case for the previous yoga’s I have had, it needed to be added to the ideapad_laptop module. Someone already sent in a patch to do this upstream. 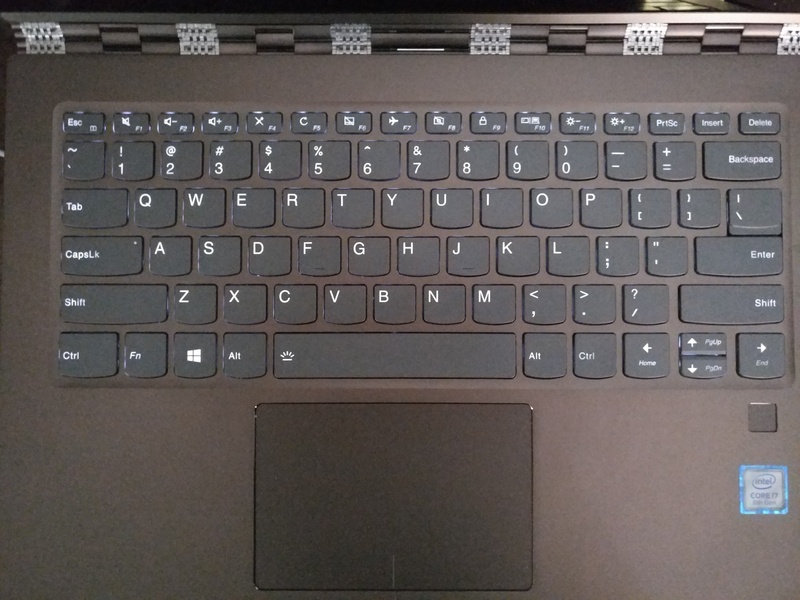 A simple blacklisting of the ideapad_laptop module for now gets things working. First, the fingerprint reader. It seems this is a synaptics / validity reader, which is a bit of an odd bird. There is a reverse engineered driver underway, but it seems stalled: https://github.com/nmikhailov/Validity90 It seems it uses encryption talking to the device and synaptics is not being very open about specs either. Oddly, on my 920 I can’t really see the device at all when booted under Fedora. Looking at it when booted under Windows shows the device name. Second, I had a fair bit of trouble with the wireless card. It’s a “Qualcomm Atheros QCA6174 802.11ac” card and it’s recognized and works, but it has had various problems with stalling out and needing to reconnect, very very slow transfer speeds, hanging and then bursting out again. It seems like it’s a firmware issue: When I removed the -6 firmware (forcing it to use the older -4 one) it seemed a bit better, at least when it disconnected it would (usually) recover, but then I upgraded to the very latest firmware upstream (that is not yet in the linux-firmware package and now it seems pretty solid. Hopefully this will all get sorted out soon by them pushing that new firmware out to linux-firmware. The new 8th gen CPU(s) really shine here over the yoga 900. You end up with Linux seeing 8 cpus (with HT) and they really make short work of most day to day tasks. I don’t usually build things or compile kernels, so the only time I so far have managed to make it spin up the fans was with thunderbird sorting and filtering a ton of emails or a large dnf update transaction. Battery life is great. I am going to have to do some real life testing on it, but it’s saying its going to get 10-12 hours or so. My yoga 900 is down to 5-6 now (but the battery is a bit old at this point). The Lenovo active pen 2 seems to pair ok with bluetooth, but then it disconnects a short time after. I am not sure if this is a Linux kernel bug or something else going on. Since I don’t care too much about the pen, I figure I can play around with it some more when I get time. So, overall, I think I will be quite happy with it for a few years. If anyone out there has questions or would like some data about the yoga 920 and Fedora linux that I didn’t include, feel free to drop me an email or pingback and I will update this article over time.